As I write this I’m totally overwhelmed with emotion! I feel so thankful, so blessed, so excited and so shocked. Aaron and I are having a baby!!! The test (or more like the 5 tests) said YES! God has orchestrated this exact moment and chose us to be the parents to the child that is currently growing inside of me. So, to say I’m overwhelmed with emotion is actually a brief understatement. But, let me back up and tell you how we found out. Last Monday, August 10th, I came home from school very exhausted since is was my first full day with my new class. It was a rough day just because we are all learning how to be back in the routine of things. Plus I just felt a little weird all day long. So, I got home and let our sweet little puppy, Hunley, out and played with her for a bit. Then decided that I would take a pregnancy test I had at the house. It was still 6 days before my missed period and I was certain it would be negative (since that’s what happened every time), but I still wanted to try and see what happened. Well, within seconds of taking the test there was a PLUS SIGN!! I can’t tell you how many times I thought about how I would react to the moment. I always visualized myself freaking out, crying and being hysterical, I’m an emotional person. Reality was quite the opposite. I just stared at it. Seriously?! Was I reading the test right. I read instructions that I had read dozens of times before. I took a picture and posted it on a pregnancy app that I had been using to see if anyone could confirm that I was actually pregnant. Soon “congratulations” were flooding in from women that I didn’t know confirming that I WAS PREGNANT!!! The disbelief in my mind continued. My next thoughts went to “should I tell Aaron?” What if the test was wrong? I don’t want to get us both excited and then have a big let down. Then I decided that we tell each other everything and I just had to tell him. Again, what I had always visualized was telling him by giving him a UTK onesie, but there was no time. I needed to improvise. So, instead I found one on the ipad to show him. Aaron got home and I was still in shock. He told me all about his day and I don’t remember a dang word he said. I was so focused on trying to not to look as befuddled as I felt. I waited until he went into the bedroom and I followed him in to tell him I wanted to order him something online, but I wanted to show him first to make sure he’d like it. I videoed the whole thing and his reaction made everything REALLY, REAL!! That is when I started crying for the first time. It was setting in. We just stood there, held each other, and we were both absolutely beaming with the gift that God had just given us. And…. soon after we left to go get more pregnancy tests to double check…all of them were positive!! The LaSuers are having a baby. I cannot tell you how much Aaron and I have talked about this moment. We never wanted to have kids just because that’s what you do. We chose to have a family because it is a calling. We have prayed about it relentlessly and God answered us. I could not be more thankful. I’m still in absolute thanks that God chose us. 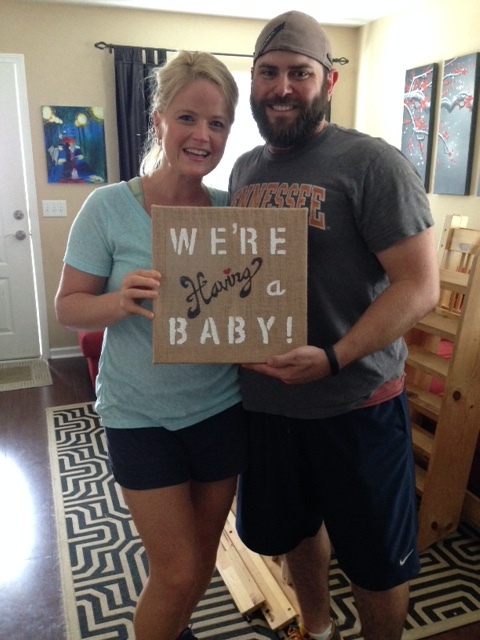 In the following days Aaron and I have looked at each other and just said, “we are having a baby! !” It is so crazy exciting! I’m am now 5 weeks along and we have our first doctors appointment August 31st and I can’t wait to hear our baby’s little heart beat!